It is here…..the heat, the bugs, the muggy, damp, high humidity of mid-western states. This will be the hardest part of the entire ride. Three months June, July and August. From here on I must rise at 3am., assemble a simple campsite, pack and saddle the horses while still dark. Unless there is some pressing need to make more miles I ride until noon and call it good. Invites to overnight are indeed welcomed and greatly appreciated, but I must rest!! and not visit so much on those stops. I get to talking and there’s no stopping me. This part of North Dakota is experiencing a 20 year cycle of flooding. If it weren’t so flat I’d swear this were western Washington. Lakes, ponds, slews. Planted fields have standing water every where. Roads had to be built up, both highway and train tracks. This is beginning to remind me of 2012 and the ride thru Saskatchewan, Canada. The mosquito’s and biting fly’s tormenting the horses this is the hard part. I ride with fly masks and the horses are covered with bed sheets most of the time. Essie Pearl and Montana Spirit look spectacular. Both are in “good flesh” as they say. I would call the look… voluptuous. I pack as lightly as possible now. Essie’s carry’s less than 80pds, cinching is a bit loose, not so tight as with a dog riding. I have a new set of horseshoes from THE BLACKSMITH SHOP(see sponsorship page) waiting to go on both girls, I’ll do that tonight. Montana Spirit is just now coming into her true size and my oh my, I think she is something else. Quick of mind and spirit, curious, beautiful coloring with feathered legs. Only now is she finding the courage to lead us. It is, when you think of it, her head leading us each and every day into the unknown. Takes courage to do that. Both of their backs are smooth, clear of any sore spots after nearly 1000 miles of travel. THIS I am proud of. It has taken years to achieve this quality of care. They’re the finest pair of long riding horses I’ve taken out, not that I have taken THAT many horses traveling with me. We won’t of course mention this to Claire Dog or Hart, (back home in Montana), but it is infinity easier traveling without those two(smiles). When I think back on the years we journeyed together, the miles Claire walked and Hart, steadfast as he was leading the tribe through Canada… I owe them a good retirement, which they are enjoying at Theadora’s Garden(see Store). I pick and cook dandelion, nettle and lambquarter greens daily. Red-wing Blackbird’s(my favorite song bird)cling preciously from last years cattail stalks. Night and day begin merging this time of year. We are on the continental divide, 1452 feet above sea level. Water now drains to the east. Each day packs and saddles must come off 2 or 3 times during a 25/30 mile ride. If sweaty, the horses backs must be washed. Or if no water, (fat chance of that) at least cooled dried and brushed as are saddle pads dried and brushed clean and soft. I continue to successfully use the SKITO SADDLE PADS(see sponsorship page) with wool hides, and other wool pads cut and shaped for this type of travel. The Black Mountain saddle from TUCKERS SADDLE CO.(sponsorship page)is soft, light and fits Spirit excellently. 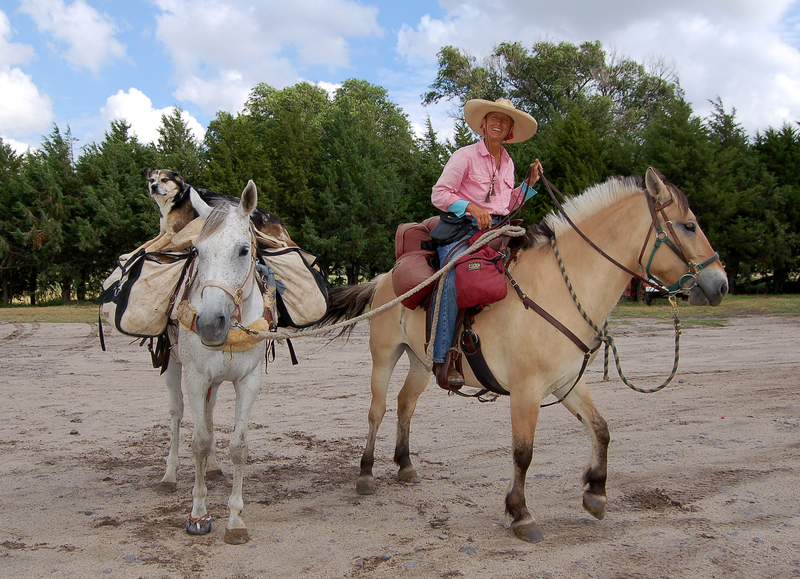 I suppose it would be sad if I could not say..”I’m happier with my saddle, gear and campsite set up than I’ve ever been.” The horses are far more comfortable, as well as myself. It’s taken years. Say goodbye to 95 yr old Berniece Higgenbotham. A wonderful visit with her and others in the community of Forsyth, Montana. Caught in rain wind west of Miles City, stay in machine shed for two nights, collect water for drinking. Spirit runs off and would still be running if not for cattle guard gates. In my long underwear and slippers I dash out and jump on Essie and chase after her. May 12th Sandy and Rod Lee help me down the freeway when I am dead ended by cattle guard gates. Visit Terry, Montana home of Evelyn Camarron the famous photographer. Meet up with Judy Stenberg from Sentinel Butte, North Dakota. I met Judy in 2010 heading home from the 6000 mile ride. 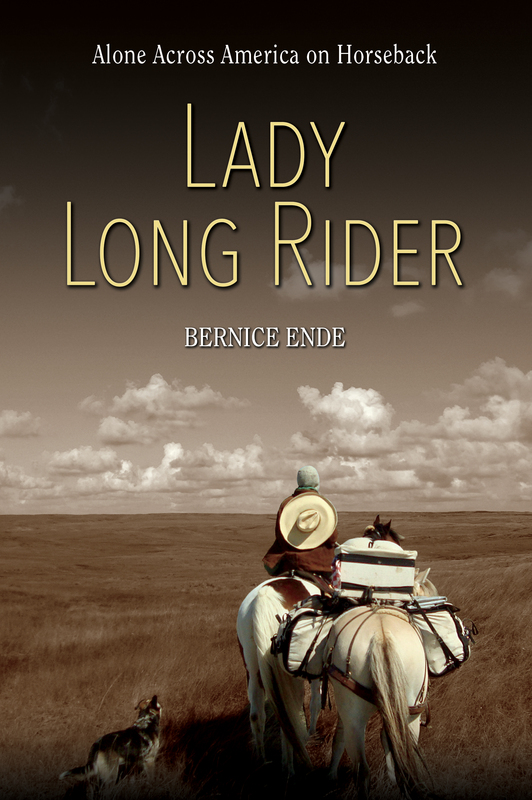 She was the postmistress there, now retired, we had dinner in Medora. May 16th Begin a long stretch of freeway and train noise. May 19th Met my nephew Mitch Ende in Belfield, ND. He is working in the oil field near Williston, ND. I get a good look at an oil boom in Dickenson. But thought the town had a grip on the growth, things were clean even with the massive building occurring. May 20th Met Teri Theil from the department of ND tourism. Also met Terry in 2010 when she and others from the tourist department helped enormously as I pressed hard into westerly winds heading home from a long 6000 mile ride. Good to see these friends I thought I would never see again. Lots of smiles and hugs. May 22nd Folks working at the New Salem fair grounds greeted a weary traveler when I rode in late under Salem Sue’s udder’s. Salem Sue it the worlds largest Holstein Cow over looking interstate 94. I laughed as I watched a herd of Red Angus bulls in a pasture west of Sue. I wondered if those bulls ever got a hankering to go up that steep hill and vist that big cow just standing there like that. Also met Faye Sanders whom I met in 2010.We had lunch and much to visit about. I think this was the real reason I chose to ride North Dakota and not South Dakota, just to visit with friends I thought I’d never see again. Received new rein’s a bit and stirrup coverings from Tuckers Saddle Co.(see sponsorship page) I have been wanting to try the stirrup coverings for sometime, not sure why I waited this long because I love these things. Not only for safety reasons but to keep my feet dry. The day after I received them I rode from Bismark, ND along a busy 4 lane hwy minding my own business and all of sudden Spirit leaped with all 4 feet with a gazelle like action, shied from something might have looked like a snake to her, if you ride much at all this will be one of those “oh yeah I know, that’s happened to me” One minute you are on the ground the next in the air and I swear I stayed in that saddle because of the new stirrups. The next day it rained and feet stayed dried!! Thank You Tuckers Saddle CO. The heat turns up. Miserable riding. Must now rise at 3am to break camp and prepare for the days ride. May 27th I rode into Medina looking for a place to camp stopped at the home of Bill and Janet Well as they had an empty pasture west of their home I thought might work. Sure enough, had a delightful meal with them, both retired teachers amoung a host of other jobs and adventures they’d experienced in life, both very interesting people. I think half the town stopped by to visit. One thing you can count on in North Dakota is hospitality. Next day I ride through Cleveland, ND to pick up a package that was not there. Had coffee at the senior center and in walked two bicyclist from Sweden who were crossing the U.S. My age, encouraging! Later that afternoon the heat was terrible and I am instructed to stop at Marge Lange home, a widow in her late 80’s still living in her home of 60 some years. An enjoyable afternoon with a lively, bright, remarkable woman. Encouraging. May 30th Next day I stop in Spiritwood to rest and eat at the Sportsman’s Bar&Cafe “where its always Happy Hour” I thought I’d ridden into grand central station. Lunch hour was just finishing up with dozens of men eating, mingling or heading back to work at the Cargill plant across the road. Wayne and his wife Hilda own the cafe, busy place great Mexican/American food. Besides the waitresses and cooks there were no other women in sight. I am slam dunked and rescued by Wayne and Billy. June is not going to easy, not with this heat, humidity and bugs.